Welcome to Fandom Friday, a weekly blog meme where we come together to talk about any and all things fandom. After you link up, check out a few other links, add some comments... Let's make this a party! 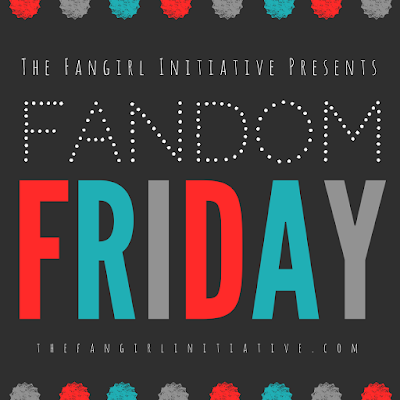 Fandom Friday is where you, our awesome readers, get involved with The Fangirl Initiative community! Every Friday, we'll post a question or topic that spans all fandoms—books, movies, music, anything—because we want to see what you love! Easy! Head on over to your blog, answer the question however you want to, and then add your link. Once you've done that, check out some of the other links, maybe leave a comment or two, and enjoy the camaraderie that comes with being a part of a fandom. Whether you're a traditional Westley and Buttercup shipper, a diehard team Edward, a Shawn and Gus BROTP lover, a controversial Harry/Hermoine fanfic writer, a forever Johnlocker, or someone who can never help but pick sinking ships, everyone has their OTPs. (One True Pairing, for those of you new to the world of shipping). We want to hear about yours! You can answer all the questions or just a few of them, or you can pick one and ramble or rant about it for days. All's fair in love. 1. What ship will you go down with, no matter what? 2. What's one ship you can't stand? 3. Which ship did you never expect to ship? 4. Is there an OTP that you think would work better as a BROTP? 5. Who have you been shipping forever?